A change is as good as a holiday, well so they say. That hypothesis was to be put under the microscope as I started the second week of my 5km training program 830km from home and working very different hours to the ones I normally keep. I'd had a taste of the local tracks with my first run on the Sunday I arrived and was very keen to explore a little bit more as well. I had decided to use the local sports ground, Victoria Park, for all of my warm up jogs. With a circumference somewhere around the 500m mark, it was perfect. Another major change to my routine was the fact that I would now be running in the morning. With long nights at work, it was the only option. A well-earned rest day on Monday was followed up by an easy 5km. I used the run to explore unchartered territory. Beginning near Dight's falls, where I had on my previous run, I headed in the opposite direction. I opted for a 5km out-and-back which was almost entirely uphill out and all downhill back. The run was made more fun by the fact that heavy rain started tumbling down about two minutes into it and did not relent. I have always had a love of the rain, I believe the official term is a pluviophile, whatever it is, I was happy and enjoyed the gallop. 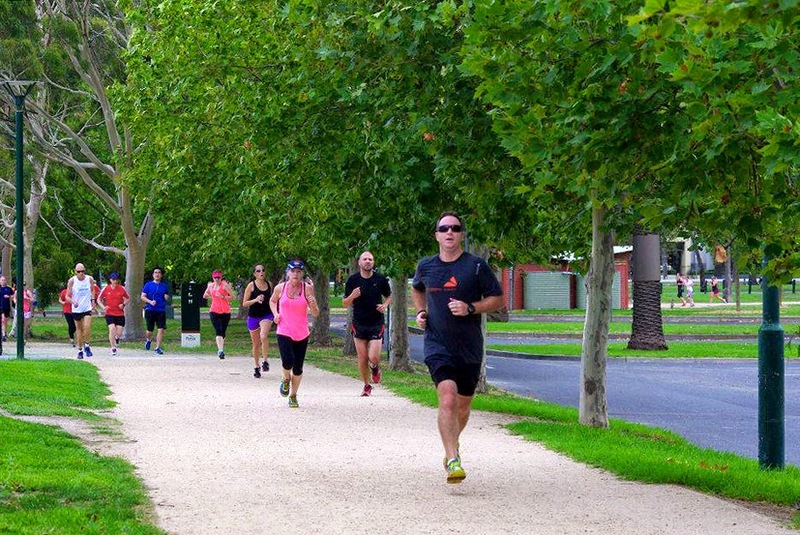 Running home at Albert Parkrun, Melbourne. The week continued with a 30 minute tempo run on the Wednesday. 7 1/2 minutes easy - 15 minutes at 10km pace - 7 1/2 minutes easy. It as a taxing but enjoyable run. Thursday was an easy 5km, taking a shorter version of the 8km course I'd run the previous Sunday. Friday was a rest day before Albert Parkrun which I had planned on taking part in on Saturday. The Albert Park course is a flat run, winding around a lake. It was certainly the biggest Parkrun I had taken part in with a whopping 355 runners lining up at the start. As a result, the first kilometre was mayhem, slowing for people in front of you, making mad dashes to an open space, slowing down again, then repeat. It felt slow yet haphazard, it was anything but that. I completed that crazy kilometre in 5:14, very zippy for me and slightly concerning given I hadn't found any rhythm at all. Slowly, a little bit of space developed and I was able to find a groove. Running by feel, I was surprised to see the second kilometre only took me 5:10. I felt good and was pretty sure that I could maintain my pace, or close to it. That augured well for my finishing time given that my best 5km was 27:55. The third and fourth kilometres were into a fairly stiff headwind and a little taxing. I was able to churn out 5:20 and 5:22 respectively and knew by then that even a six-minute last split would see me set a new personal best. I came home in 5:17 and my official Parkrun time was 26:28. almost a minute-and-a-half better than I had ever gone before. I had surprised myself to say the least, maybe all the training was paying off. My partner arrived to stay with me for a week on Sunday and we ground out 8km on the picturesque Yarra Park course that I had run on a week earlier. It will be good to have a training partner for the coming week. The weekly totals finished at 33.8km in 3 hours and 27 minutes with an elevation of 212 metres. I am hoping to run in another Parkrun next week as well as another local Fun Run, more to look forward to.